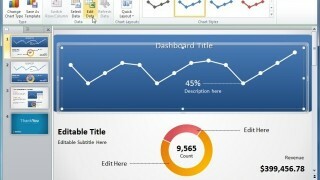 If you require presenting statistical representations of Big Data or elaborate details about business project performance then one of the best methods to do that is to use a Dashboard PowerPoint Template. 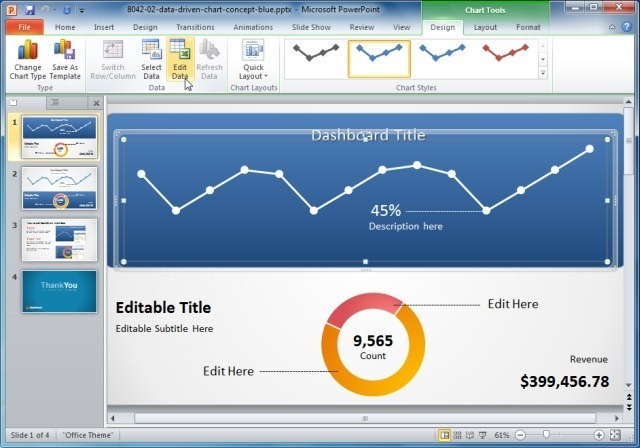 Such PowerPoint Templates provide sample slides with multiple sub-sections which can be populated to generate visualizations for presenting data and stats in a summarized and easy to grasp manner, with a clean layout. This is an excellent Dashboard template which comes with sample slides with sections for adding data to create charts, tables, graphs and slides with basic information about a topic. 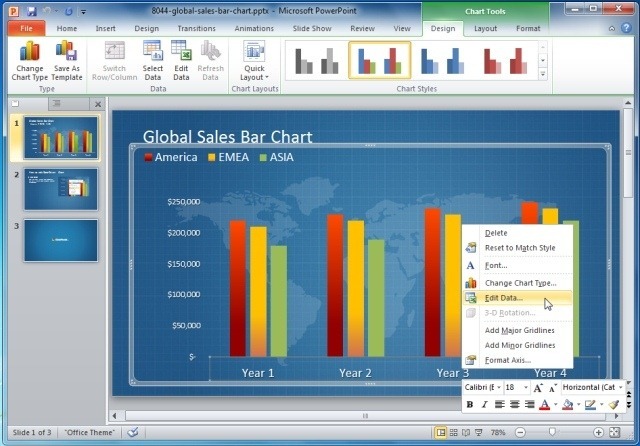 As evident from the below screenshot, this template is highly customizable and editing the existing charts and layout can be easily done using default PowerPoint features like the Chart Tools or Drawing Tools. Moreover, this template can also serve as Dashboard Ideas For PowerPoint Presentations related to business, finance, quarterly projections and the like. In case you would like to change the blue color or the shape/type of the given graphs, this too can be done via PowerPoint Ribbon Menu options. In other words you can simply click and edit sections in this template to create visual representations of your ideas and data in a manner that will be easy to present during presentations and will make it possible for your audience to understand the given information quite easily. 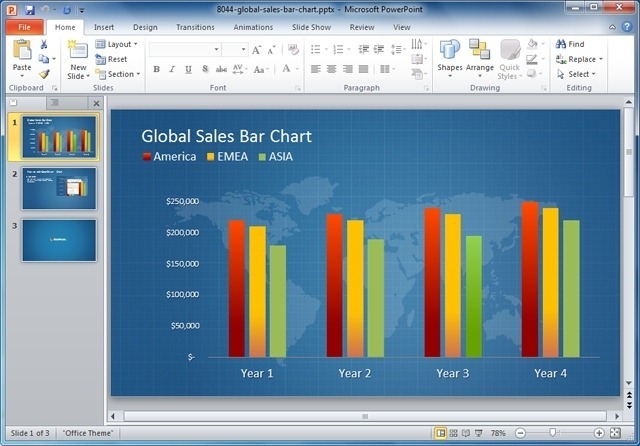 The Blue Data-Driven Chart PowerPoint Template provides instructions for making Dashboard slides using existing resources, which can help you create business presentations in no time. If you are looking for a template that can offer a visually appealing chart that can accommodate complex data, then the Data Driven Chart PowerPoint Template is just what you need. This professionally designed template comes with a pleasing blue color tone, with the right mix of multiple chart colors to create data charts and graphs. 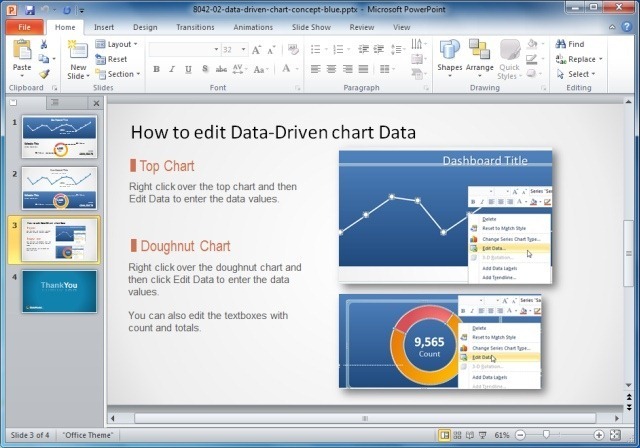 You can click and edit the given layout to add your own text, images, clipart and populate charts by simply adding your own data (via PowerPoint Chart Tools). To create professional looking charts in less than five minutes, check out the link given below. Tags: Analysis Templates, Big Data, Business, Business Analysis Tools, Business Diagrams, Business PowerPoint Templates, Business Presentations, Business Templates, Diagram Templates.